Seal Coating | Norwest Construction Inc.
Seal coating protects your pavement from weather, erosion, and oxidation, while filling minor cracks. 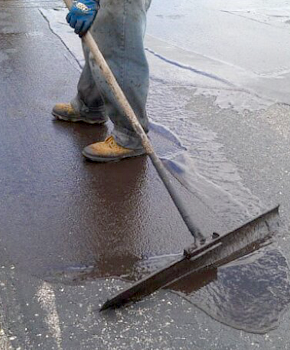 Brewer Cote is premium commercial grade, high solids concentrated coal tar pavement sealer. Not to be confused with pre-mixed products supplied by local “Big Box” hardware stores or inferior asphaltic based commercial grade sealers. Norwest Construction Inc. uses TARMAX, a latex additive to improve the sealers’ durability, gas and oil resistance, drying time and color hold. The asphalt area will be thoroughly cleaned using a power sweeper or power blowers to remove all dirt and loose particles. All weed and vegetation will also be removed. Accumulations of oil and grease in car stalls will be pre-covered using a poly oil seal to help ensure the bonding of the sealcoat. Norwest Construction Inc. adheres in strict accordance to The Brewer Company’s manufacturers mix recommendations. Water addition is carefully added to the sealer concentrate. Aggregate is also added in the form of black sand to increase durability along with TARMAX. Sealer is applied by hand with squeegees and/or brooms as the best application process. Norwest Construction Inc. also offers an economical alternative of spray coat. Norwest Construction Inc. offers three types of cracksealing: routing, wire wheel cleaned, or cleaned with compressed air or mechanical blowers. Depending on the width and type of crack (Longitudinal, Expansion or Alligator), Norwest Construction Inc. will consult with you on budget, and longevity of repair desired. Once determined, Norwest Construction Inc. will then clear cracks of all dirt, debris, and vegetation. A premium construction grade hot rubberized tar, designed to meet ASTM specifications for Municipal and Commercial parking lots to minimize tracking and pickup from pedestrian foot traffic, is poured into the cracks. With one company you get the entire package. Your surface will be built quickly and efficiently. From roto-milling – through the seal coating to pavement marking / signage, and even concrete flatwork. To protect your asphalt surfaces and maximize their lifespan, Contact Us. Find out how we stack up against the competition. We are Illinois and Wisconsin D.O.T.-certified, signatory to local construction trades, and regularly supply budget numbers for upcoming projects.